As the name suggests, camelina oil is obtained from the tree named Camelina Sativa or ‘Gold Of Pleasure’, which belongs to the ‘brassicaceae’ family of plants and is native to Europe and Central Asia. Camelina Sativa is basically a small annual shrub having tiny greenish or pale yellow-colored flowers. It often grows in flax fields and hence, is also known as ‘false flax’. Though the plant has been considered as a weed in Europe and America, it has multiple uses including livestock feeding, lighting up lamps, medicinal purposes, and so on. 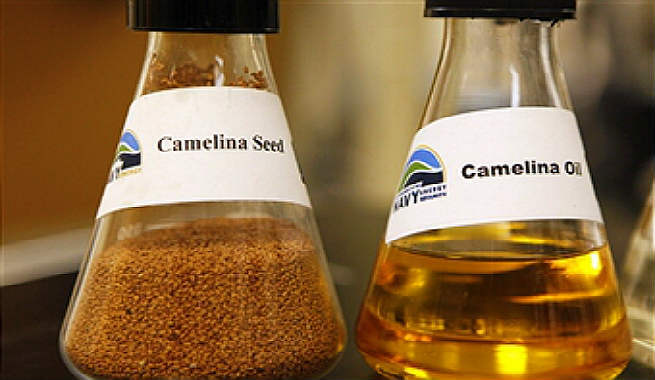 Camelina oil, also known as gold-of-pleasure oil or pleasure oil gold, is a golden or dark olive-colored oil with a nutty flavor as well as a rich herbaceous and green woody odor. It is extracted from raw camelina seeds through expeller pressing in which the seeds are crushed to collect the unrefined oil directly. Even though the seeds resemble flaxseeds, the oil tastes much better than the traditional flaxseed oil and offers superior nutrition, higher stability, and lower rancidity at the same time. Like the camelina plant, camelina oil is also quite versatile and can be used for cooking, skin care, hair care, preparation of cosmetics, etc. Essential fatty acids (EFAs) are needed for making our skin healthier, maintaining proper skin functionalities, and treating various skin conditions. As our body cannot produce EFAs naturally, topical application of camelina oil can deliver it to our skin in significant amounts. According to studies, this oil is loaded with polyunsaturated fatty acids like omega-3 fatty acids and omega-6 fatty acids, which prevents transepidermal water loss (TEWL), dermatitis, and visible skin abnormalities. Being rich in EFAs, camelina oil offers excellent anti-inflammatory benefits. It provides a huge amount of omega-3 fatty acids to our skin, which helps in reducing inflammation as well as swelling while relieving and soothing the skin efficiently. The oil can treat inflammatory skin conditions like eczema, psoriasis, etc. by easing dryness, redness, itching, chafing, etc. Camelina oil creates a healthy barrier all over our skin in order to enhance its natural preventive properties. This helps in maintaining the hydration of our skin’s surface by reducing water loss, especially in premature and newborn babies. It also averts bacteria and other harmful foreign substances to enter broken skin. The high vitamin E (tocopherols) content of camelina oil offers very good protection to our skin against photo-oxidation. The antioxidant properties of the vitamin not only avert sun damages but also minimize the appearance of signs of aging. Camelina oil works as an effective emollient that hydrates the skin, restores its natural moisture, nourish it from inside, and makes it softer and smoother. Massaging the scalp with camelina oil is a superb hair care treatment as it provides nourishment to the scalp, reduces dryness and flakiness, and wards off dandruff easily. Warming up camelina oil and massaging the scalp gently with it works as hot oil conditioning treatment, which turns the hair softer, smoother, and healthier. The antioxidant properties of camelina oil play a key role in preventing the premature graying of hair. 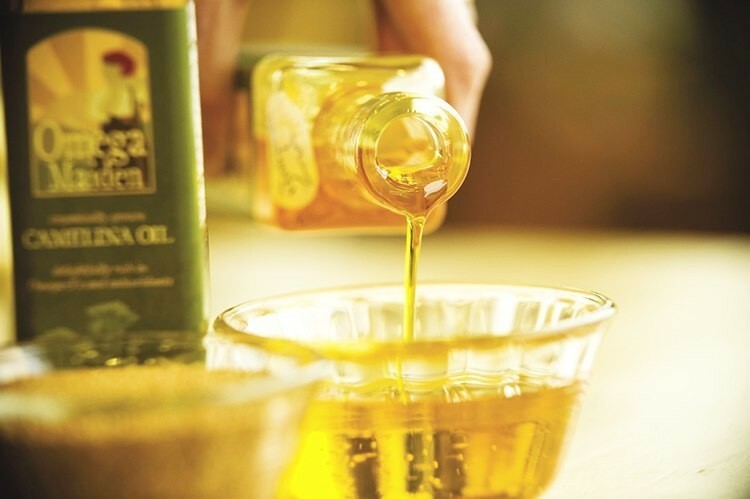 So, opt for camelina oil and look beautiful!